If you spin around in circles as fast as you can and then attempt to walk in a straight line, you’ll experience what your cat probably feels like if he’s suffering with vestibular disease. There are two types of vestibular disease: peripheral and central. In this article, we will discuss the peripheral form, which, with treatment, generally carries a good prognosis and is much more common than central vestibular disease, which attacks the central nervous system and brain. 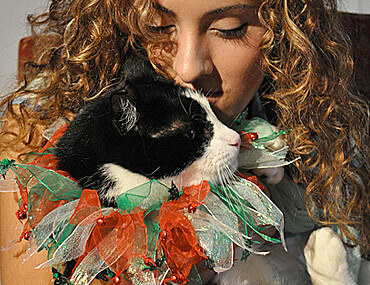 In cats, this disease is idiopathic, meaning its cause is not known. It usually happens without warning or as result of a concurrent condition, and can affect cats of any age. The most common symptom of vestibular disease in cats is dizziness. No, your four-legged friend hasn’t been hitting the bottle…but it may look like she has! Once consulted, your veterinarian will perform a thorough physical exam, looking carefully at your pet’s ears, and may recommend diagnostic tests to look for concurrent conditions and to rule out other disorders that mimic vestibular disease. Treatment will depend on the discovery of any concurrent conditions or underlying causes. If there is no identified cause, your veterinarian will suggest supportive care that you can provide your dizzy kitty while he recovers. The good news: most cases resolve quickly, with cats recovering from this disease without medication. There is no known prevention for idiopathic vestibular disease. Routine health care and physicals including diagnostic tests can identify—sooner rather than later—any underlying conditions that could possibly cause vestibular disease. Call your veterinarian immediately if your cat seems dizzy or “drunk”—vestibular disease can happen quickly and can be scary, for both you and your pet!